Accommodation is available to members of the Queen Mary Club and their guests, and to members of affiliated clubs. All accommodation rooms are on the first floor of the main building accessed by the main stair case. There is a sitting room, breakfast room and 2 bedrooms on this floor. In each room there is a compendium with up to date information on Hobart and surrounds and the tourist attractions nearby. In each of the rooms there are bathrobes and hair dryer. Please note the accommodation is on the first floor and there is only stair access. No lift. There is a self -contained apartment situated at the rear of the Queen Mary Club with its own entrance to make you feel secure right in the City. The Mews has a comfortable double bed in the spacious bedroom, a separate sitting room and kitchen and its own bathroom. Tasteful plain décor enhances this very cosy Mews. Breakfast and car parking are included. A queen sized bed with shared bathroom facilities. 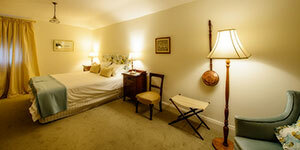 A delightful spacious twin room with shared bathroom facilities.